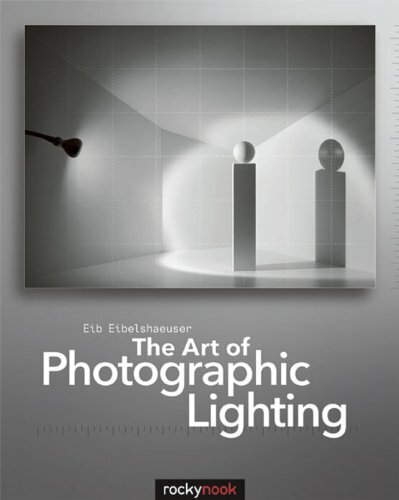 Rocky Nook Press recently sent me a review copy of Eib Eibelshaeuser’s new book, The Art of Photographic Lighting. It took me a little longer to write this review than it normally does for two reasons: I kept re-reading paragraphs that seemed particularly significant, and I found myself taking notes. Both of these slowed me down as I am usually a fast reader. I think I was expecting a book with drawings of how to arrange lights, but instead I found that it was much more involved than that. Instead, it began with the use of light in classic painting and then moved into the basis of human perception. Light sources and shadow design came next along with ideas about directional lighting and lighting design principles. Add to this a history of photographic lighting design and post-exposure techniques, and accompany all of it with a multitude of illustrations, diagrams and samples and you have a thorough examination of light and how a photograph works in terms of conveying information, design, and mood. Ask any experienced photographer what they photograph and they will answer not with places or people but will say that they photograph light. It is light that gives us shape, form, and texture and defines space and volume. It is the quantity of light that allows us to select f-stop and shutter speed and it is the quality of light that defines the mood, the shape and form of objects or people, and the crispness or softness of the image. Mr. Eibelshaeuser begins with the idea that the the awareness of light direction has an innate “right” or “wrongness” to it because we have been exposed to the sun as a light source for as long as mankind has existed, and we have been programmed by evolution to accept light from above as being “normal”. Photography began as a substitute for, or an adjunct to, painting and thus depended upon natural light to define what was “right”. But the development of artificial light and now of digital lighting in images has begun to allow light from any direction to be accepted in an image. What is “acceptable” may very well change in the future. Illustrations of the shape of the bulb and wiring element within it allow the easy identification of the kind of light source that is available to the photographer, and the light output colors are shown (pp. 72-75) to allow the photographer of visualize the results of using different kinds of light sources. The book uses a model of a rectangular pillar topped with a round ball and the whole thing within a room-like box to illustrate the quality and “look” of each type of lighting source, bulb, bulb-color, or reflector and it is this series of examples that carry on throught out the book. I found this an invaluable “show and tell” type device. (As an aside, I’d love to see all this as an APP for the iPad along with all the shapes and element configurations of the light bulbs). Photographers would love it. Classic photo lights, light brush, electronic flash, and energy saving lamps are all discussed and the “look” of each lighting type is shown in example images. Additive and subtractive color systems are defined and examples of how images are created and reproduced are covered. Mr. Eibelshaeuser shows how shaping light with softboxes, reflectors, or mattes is done, and gives us examples of how we can control light through reflection, transmission, absorbtion, refraction and interference. “Hard” and “soft” light‚Äîsome of the qualities of light‚Äîare discussed and illustrated. Night, dusk, air, and light polution are all “looks” that can be used by the photographer to convey mood as well as literal information. The wonder of RAW Processing in our digital world allows us to capture images that film could not achieve, and combining RAW processing with HDRI (high dynamic range imaging) allow is to capture images that cover some 26 f-stops rather than the 4 f-stops more commonly associated with film. Choosing to reproduce an image in black and white instead of color is discussed as the black and white image depends upon value rather than color for its differentation of shape and form as well as mood. The illustrations are excellent and prolific and arranged where it is easy to see the relationship between text and illustration. Finally, remember that Rocky Nook Press produces its books upon acid-free paper and the owner can expect to have sharp, crisp, unfaded images for years to come. The beginning as well as the advanced photographer will learn a lot from this volume and it is well worth adding to your library. It’s 330 pages and a paperback.